In 2364, he was named conn officer on the USS Enterprise-D under Captain Jean-Luc Picard. 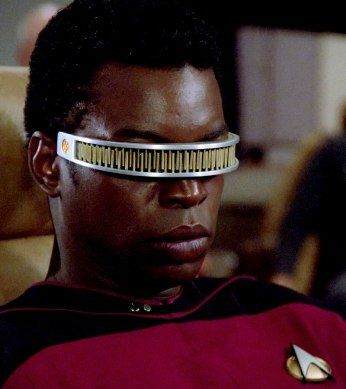 While investigating the deaths of the SS Tsiolkovsky crew, La Forge contracted a variant of polywater intoxication, causing him to lose his inhibitions. Doctor Beverly Crusher used La Forge to test her vaccines and was able to develop a cure. Along wit everyone else on the Enterprise-D Geordi was transported to a different quantum reality and the year 2379. After the resignation of Commander MacDougal Geordi wanted to follow in his double's footsteps and become Chief Engineer but Captain Picard elected to select a Chief Engineer who was not only familiar with a Galaxy class starship but was from the current time period. Geordi was a bit bitter over getting passed over for the Chief Engineer's job. He was assigned as part of the team to install the quantum slipstream drive. While working on the slipstream Geordi commented how much easier it would be at a starbase prompting Data to assign him the task of creating a proposal for the SCE about the construction of starbases in the Delta Quadrant.